which fonts do i need to embed? i found somewhere arial doesn't need to be embed, but it doesn't seem to be the default sans-serif on newer microsoft stuff? I use PDFCreator to create PDFs and I always embed all fonts for convenience. 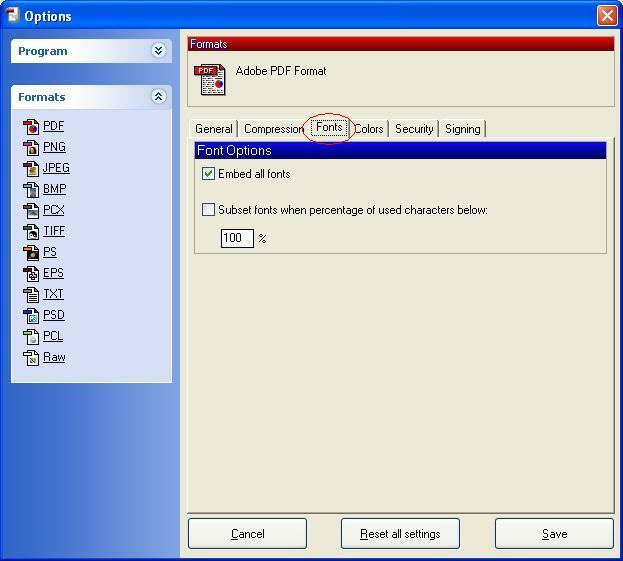 In the Options window, click Formats to expand the Formats panel. To embed fonts, click on the Fonts tab and check the "Embed all fonts" box and uncheck the "Subset fonts when percentage of used characters below" box. Not the answer you're looking for? Browse other questions tagged pdf microsoft-powerpoint fonts embedded-fonts or ask your own question. How to embed Arial in PDF when PDF has Helvetica? Why is my system (Ubuntu) using FreeSans font for sans-serif/arial/helvetica web rendering?